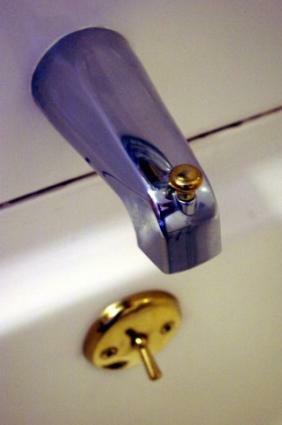 Fixing leaking tub faucets can save you aggravation and money. According to the Environmental Protection Agency's website (EPA) a faucet leak that creates one drip per second can waste eight gallons of water every day, which comes out to almost three thousand gallons of water every year, and that's just one drip. Multiply that by the number of dripping faucets in your house and you have something to worry about. When you waste water, it's more than a little H2O going down the drain. You're wasting money too. You pay for the drip on your utility bill as additional water usage, but you also pay for it in increased infrastructure costs. Higher water usage means more water treatment, and a greater negative impact on local ecosystems. This can be a story with a happy ending if you grab a screwdriver and fix the leak...and all your other water leaks too. Turn off the water to your tub. The shutoff may be in the bathroom, or you may have to turn of the main water supply to the house. This sounds like a big deal, but if you aren't currently doing the dishes or laundry, it's easy and relatively non-disruptive. There will likely be a main shutoff valve in your yard, basement or laundry room. Take off the cap that covers the screw assembly on the faucet handle. The cap is usually plastic and snaps in place using short plastic tabs. This is a decorative piece, so use some caution removing it. If you employ a screwdriver to pry it off, cover the cap with a piece of scrap fabric to protect it from scratching. Removing the cap will reveal the screw that holds the assembly in place. Remove the screw. If it resists, try using a lubricant, like WD-40 on it. If the faucet hasn't been serviced in a while there may be oxidation that will make it harder to remove the screw. A little time and elbow grease ought to do the job, though. Once the screw is out, you'll see a stem inside the housing. You'll need to remove it, but the job may require a special wrench, a tub socket wrench available at any plumbing supply or home improvement outlet. Now that you have access to the housing or cavity, remove any debris. You may need a flashlight to get a good look. Clean the stem thoroughly using soap and a damp cloth. Usually a leaking faucet is the result of a worn or damaged seat washer, a small rubber ring. Take off the screw holding the washer in place and remove the washer. At this point you can evaluate the washer to see if it's worn, but since you have the assembly apart anyway, and you won't necessarily be able to distinguish the amount of wear that can result in a small leak, plan on replacing the washer regardless. Finding a replacement washer will be easy if the old one is still in one piece. Just take it to your plumbing supplier or home improvement store and use it as a template. If the washer has deteriorated through, you can usually get an idea about the type of replacement you'll need by looking at the area on the housing where the washer is installed. The area the washer fits into is called the washer seat. Take a look at it just to be thorough. If a new washer doesn't take care of the problem, the seat is probably damaged. Evaluating its condition now is a good idea. You can replace the seat if you have to, but starting with the most common and least expensive fix, the washer, is the best option. When in doubt, get the name of the faucet manufacturer and model number, and use that to source a replacement. Before you head out to the store, check the entire stem for wear. If it looks worn, take it with you to your retailer. He can help you evaluate its condition. Once you have a replacement washer, reverse the steps above to put the handle assembly back together again. It's tempting to overdo tightening everything in place, but that may cause problems, so be firm but not brutal. Turn the water back on and check your work.